Asia's dog meat trade was recently debated in Britain's Houses of Parliament for the first time. It was a passionate debate that touched on concerns about animal welfare, human health and crime that so define the trade. But it also raised the idea that eating dogs is cultural and, as such, Westerners with our soppy sensibilities about animals should be cautious in interfering. I strongly disagree. The idea that the egregious animal abuse of the dog meat industry has any place in Asian culture is as offensive as it is naïve. Whilst the regionalized eating of dogs alongside other animals may be a historical fact in parts of Asia, it bears no resemblance to today's large-scale, lucrative dog meat industry underpinned by illegal activity and the mass movement of millions of dogs across whole countries. China is a case in point. The consumption of dog meat does have historical precedence in China, but you must go back a very long way in China's history books - to the Han Dynasty 202 to 220 AD in fact - to find an era where dog meat was last advocated as a delicacy. Subsequent dynasties dismissed eating dogs as indecent, and in today's China dog meat is only consumed by an estimated 20 percent of the population. Even then, much of that consumption is confined to pockets of the country, and among older consumers in rural areas and in the country's ethnic Korean region. It's true that during the dreadful deprivations of the Cultural Revolution in more modern times, starving families did kill and eat dogs to survive. But let's hold off before jumping at that exceptional circumstance as "typical" of Chinese culture. China's now infamous Yulin dog meat festival is not "tradition" either. It began in 2009, the brainchild of local dog meat traders attempting to boost dwindling sales of dog meat. 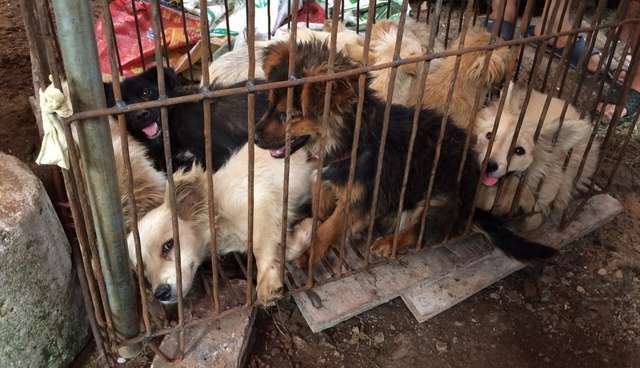 Yulin authorities thought a festival might also be a boon to local tourism, a gamble that spectacularly backfired when the global media spotlight exposed Yulin's horrors. The trucks stuffed with hundreds of live dogs and cats headed to Yulin every May and June have nothing to do with culture and everything to do with profit and crime. Most of the animals crammed onto these vehicles will have been stolen - pets grabbed from the city streets, still wearing their collars as they are offloaded, terrified and broken, in Yulin's back-alley slaughterhouses. In South Korea and Vietnam, dog meat is arguably eaten more regularly, but not as a staple food or cheap protein source, but as a delicacy more expensive than pork and other meats. It is primarily eaten by men in the misguided belief that it has medicinal properties and increases male virility. This so-called traditional belief has no foundation in science. "I will happily debate culture with anybody, because it is very important, but slicing limbs off living animals or burning their skin off with a blowtorch while they are still alive is not culture; it is barbarism." And that's the crux of the issue. Culture and tradition can be used to excuse all manner of dreadful acts against people as well as animals, but really it is too often used as a smokescreen for behavior that is cruel and inhumane. In China, where an estimated 20 million dogs are killed each year for human consumption, Humane Society International works with Chinese animal protection groups across the country in pursuit of an end to this trade. They welcome Western support, and don't wish to see us fall silent. V Shine Animal Protection Association in Dalian is one such group, and secretary general Dezhi Yu is quite clear on the matter: "We implore people in the UK, US and other countries not to be convinced that animal cruelty should be tolerated because it's Chinese culture" he says. "It's not our culture, it's appalling and it must end. The modern day dog meat trade is animal abuse on a massive scale, intolerably cruel. There's nothing honorable or cultural about stealing dogs or beating and brutalizing them. This is not the China we want." Humane Society International is committed to exposing and ending the cruelty of the dog meat trade. Help us, pledge your support.